It has taken so much longer than I’d intended but I’ve finally managed to update my website. The combination of an incredibly manic 6 months couple with a wobbly brain that honestly couldn’t remember how to navigate my way around it’s back end features meant that many an evening has been spent re-jigging the pages and adding new ones. Hopefully it looks fresher and is easier for visitors to use. There are two big additions to the website. First there’s a new SLOANmade page with the latest Seersucker bags available to buy ( with more to come). There’s also a Latest Designs section on the front page showing you which of my knitting patterns have been published most recently. The main change is that whilst the site shows all the patterns available to download in PDF form the handling of that process is now done either through Loveknitting.com or Ravelry.com. In the Online Shop when you see a design you like click on the picture for more information like materials, tension, sizing and measurements. You’ll then see the price of each pattern (£3.60) and to buy you’ll need to click on the pink link on that page to be re-directed to www.loveknitting.com where the patterns can be found in the Independent Designer section and you can complete the payment process. To buy the patterns through Ravelry go to the new Ravelry tab in the menu at the top of the screen then click on the pink link or the big picture below it and you’ll be re-directed to my Pattern Store on www.ravelry.com where you can again buy the patterns as PDFs. I wish I could have added a link to that tab but my poor brain couldn’t figure it out, sorry! I’d love to know your thoughts on the look and feel of the new site – after all your opinion counts, I know where everything is (I think) but if you can’t find it please let me know. 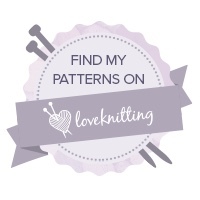 I’m hoping to find a way to add back in the free patterns and ‘Help’ section without making it too cluttered so keep checking back. In the mean time enjoy.